RemGrit bandsaw blades, carbon steel bandsaw blades, bi-metal bandsaw blades, bandsaw blades. Tungsten carbide grit bonded to a tough alloy steel back. High heat and wear resistance. No teeth to snag or strip. Provides longer cutting life on hard, abrasive materials such as fiberglass and epoxies. Available in custom welded band lengths for standard and portable saws, or in 250' coils, which are easily cut to length and shop-welded using regular control settings. 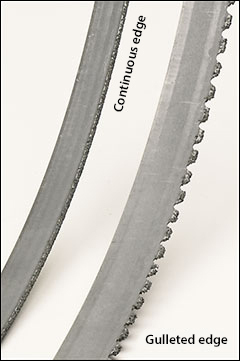 Other bandsaw blades are available, such as inexpensive carbon steel blades, and bi-metal blades for production cutting a wide range of steels. Use gulleted edge blades for general cutting on materials 1/4" and thicker. Use continuous edge blades on material that is thinner than 1/4" and also on hard, brittle materials with a tendency to chip easily. These continuous edge bands should be used on machines with carrier wheels at least 24" in diameter. Using smaller wheels will give proportionately less band life. Blade edge grit options available on most widths include extra-fine, fine, medium, medium-coarse, or coarse grit. Use finer grit for finer finish, or on thin materials, and materials that chip easily. Use coarser grit for faster cutting, thicker materials, and metal work. Below are three popular 0.025" thick blades. Please call for a quote on the size of blade you use. are 1/4", 3/8", 1/2", 3/4", 1", 1 1/4", or 1 1/2" widths. For straight sawing, use the widest blade possible. In contour work, select your blade width based on the minimum radius listed below. Radius limits vary with material type and thickness, feed force, and pivot point. The following radii are based on cutting 1" thick metal. are listed below. Both the 1/2" and 1 1/4" wide blades have a thinner option for smaller wheels.